Cupcakes 'n Daisies: Yet Again, More Red . . . . Your barn quilt in the post below is dreamy! Love the fabrics! It looks like they all play well together. It probably would have been more fun to walk down aisles after aisles of gorgeous fabrics to pick from, but either way, you picked up some fabulous fabric for your bundle. I sure like it. You did a great job picking these fabrics Thelma. I love them! They do look good either way. I love getting fabrics from the FQS but the postage is getting a little expensive out to my neck of the woods. It's as shame! Oh my....what a great pattern for those reds and have to say I also love the reds! You always come up with great projects to do and okay....might do that quilt also as I have been eyeing it for some time. I will never get tired of seeing your red posts..
Fabulous selection of reds! 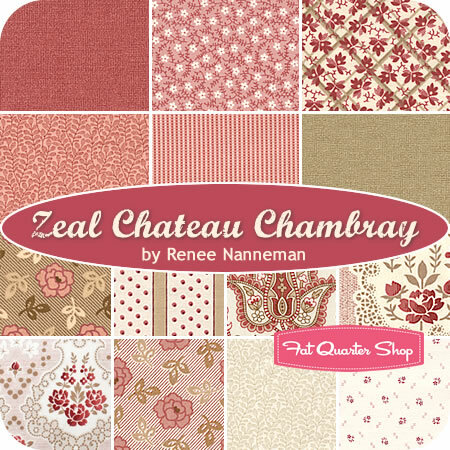 I love the Chateau Chambray; would be beautiful background with a huge variety of reds. 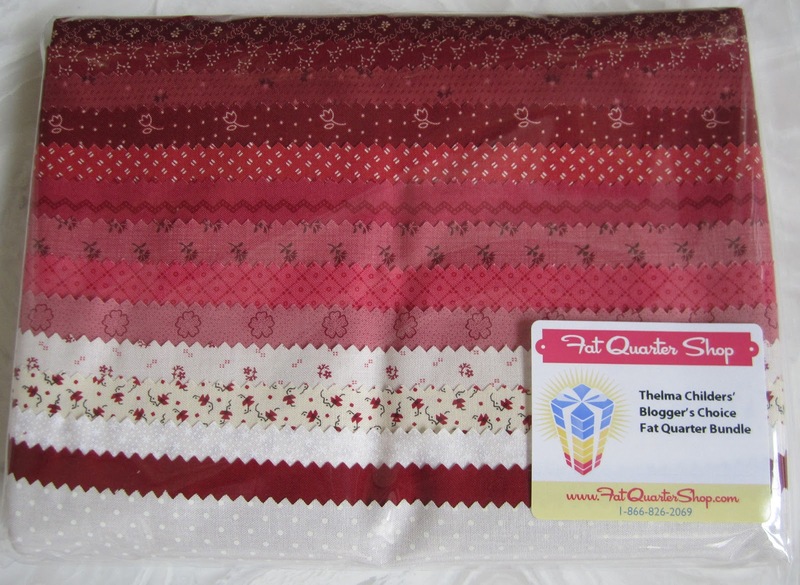 Your red bundle is on my list of "must have's..." my quilt group is having a heart block exchange later this year. I have a foundation pieced pattern selected, and I decided to use your red bundle for the hearts! I never get tired of seeing the reds! Love your collection. Congratulations on your bundle! 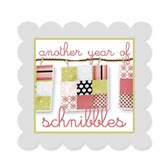 (are you keeping a Thelma bundle for your "scrapbook" too?) Tickled Red is a perfect name! I like the red results you're showing so far. Very nice. And interesting about how you chose the fabrics. I love your little stars! I bought this pattern - now I just need the bundle to go with it! It's so hard to find great 'background' fabric especially if you want one with just a little hint of the color you're using. The one you pictured here is WONderful! LOVE your bundle! Can never get tired of looking at anything red. Red is the best. Love your fabrics. Great name for your project - I'm Tickled!! I love making things my own, and have bought bundles just for the sheer joy of how they look. When I decide it's their turn to use them, it will be a pleasure to slowly untied the ribbons. Never stop posting RED!! I'm glad your bundle finally arrived! 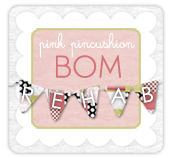 The fabrics look great the way FQS sent them, but your redo is so cute. Red is such a happy color! Since you are actually using your fabrics, you'll have to order another bundle to keep as a collectable! I would have not even looked at that fabric line, it looks pink to me. Glad you showed the differnece. From now on I will take your advice and look at the manufacture's website. Love that pattern, wish I didn't have so much on my plate right now. 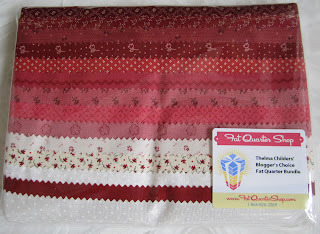 I received my Thelma bundle yesterday, and am looking into a great pattern to incorporate my first red and white quilt. 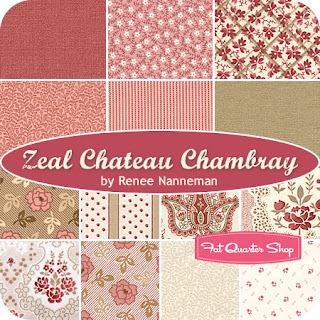 I also fell for your picture of the Chateau Chambray collection - I don't remember seeing that one before. I had to get me a FQ bundle of that as well. Thanks for the influence! Cute! It must have been a hard decision to go small... or go BIG with that bundle. Those reds are fabulous. I'm crazy 'bout red. Your little stars are cute.